Living in a different culture gives one many opportunities to be the star of an embarrassing story. I've had a lot of good laughs over my years in China, both because of things others do that amuse me, and things I do that amuse them. This week I was playing a game with some of my sophomore oral students. The game had students grab pieces of colored candy from a small plastic bucket. Since many of my teammates teach this same class, we had one team member buy the buckets for the group. One day I walked around campus carrying these little buckets full of candy. Everywhere I went people wanted to know what was in the buckets and why I was carrying the buckets around. I just assumed that I was really popular and that Mr. Wu’s candy buckets intrigued people. Since I am a person who enjoys getting attention, I planned many more days of carrying these buckets around even when I would not need them anymore. I will do whatever gets me the most attention, since I do not have a foreigner face to attract attention; these buckets were just the thing for me. At the end of the day a student of mine asked me if I knew what these buckets were used for. Thinking I was witty, I told her that they were used for colored pieces of candy. She gave me no response (not even a courtesy smile) and then proceeded to explain to me that the buckets are used for little kids to go pee in. The entire day I was walking around campus with pee-pee buckets filled with candy. No wonder my students were not very excited about reaching into the bucket and grabbing random pieces of candy out. Good thing my little daughter Samantha is not being potty trained now, or else they really would not have wanted any candy! Here's the pot, in context. 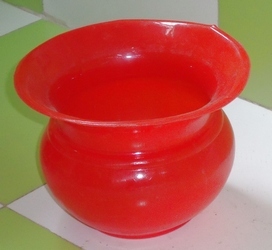 This public domain photo was taken at a "youeryuan" (pronounced "yo-are-you-en"), which is a pre-school for kids age 3 to 5, where the kids are quickly trained to use such pots. The white porcelain trench you see is what we foreigners in China call a "squatty potty". You don't sit to use it; you squat. Believe it or not, it is not too hard to develop the right flexibility and balance when squatty potties are all you've gotty. 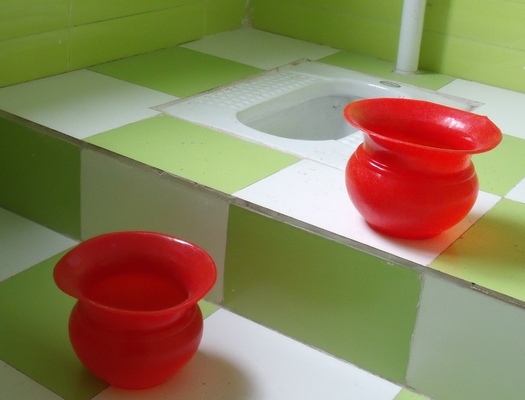 As this embarrassing story teaches, China also has plastic squatty potties that are literally pots, and they should never be confused with candy pots.